Ross, Deb & I had worked together previously when they engaged my services to build their architecturally designed carport in 2017. The carport was not your standard carport but rather a beautifully designed Hamptons style carport integrated into the front entrance of the main house complete with a Tallowood deck and front steps. This time Ross & Deb engaged our services to help design and renovate their existing ground floor. 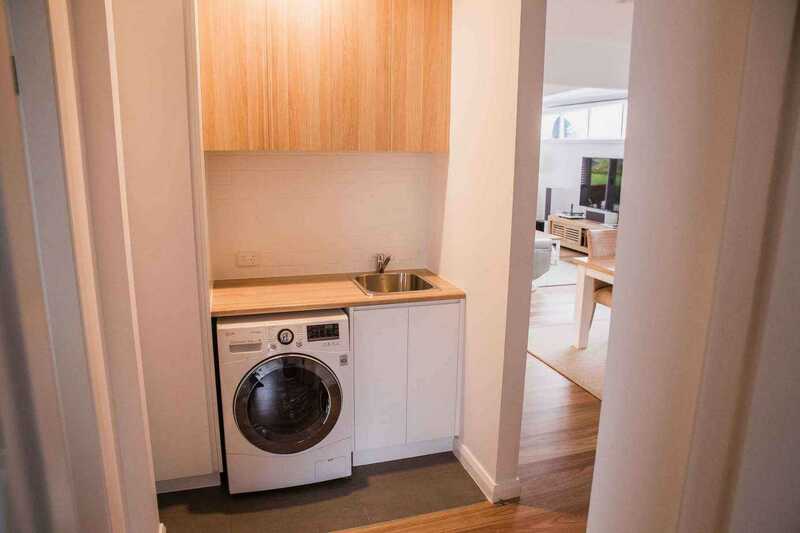 Within the existing space was a kitchen, bathroom, laundry, lounge, & two bedrooms. The kitchen, laundry & bathroom areas were very congested and outdated. High on Ross & Deb’s priority list was a high-end open plan living arrangement. Ross & Deb dreamt of a new open plan living arrangement that incorporated all the same key areas except without the exclusive separation from one room to the next. 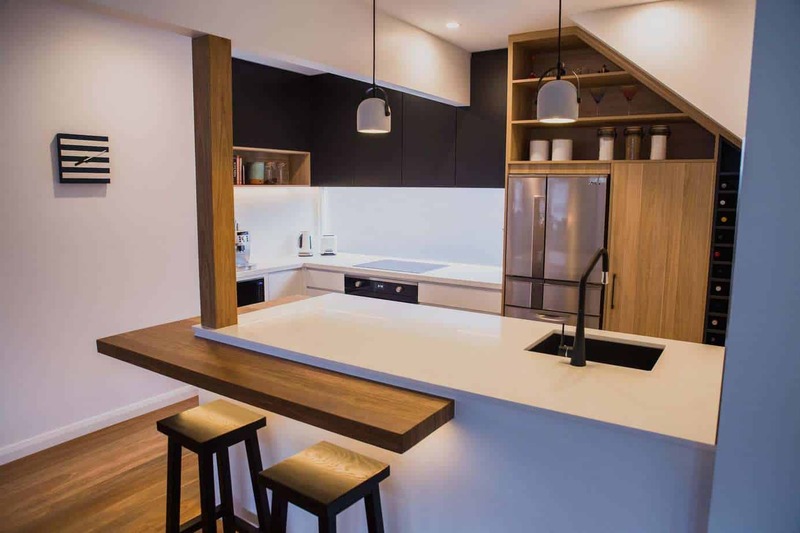 We were able to engage Creative Space Constructions to assist with the design of their new open plan kitchen complete with solid timber breakfast bar to match their newly installed Hardwood Blackbutt floor that runs throughout the entire ground floor. 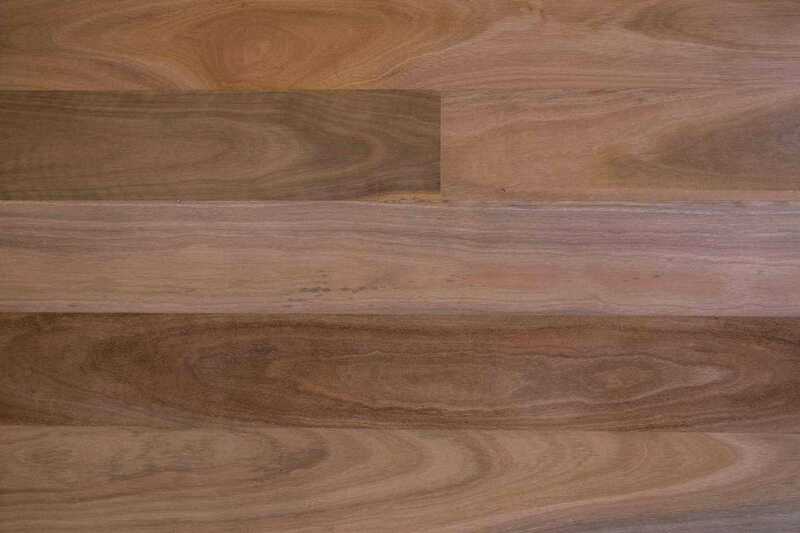 The flooring previously was the original cypress pine flooring that was a mix of old and new. Creating a design that met the client’s goals whilst maintaining some of the existing structural beams & posts was complex, however, we were able to overcome this challenge by thinking outside the box. 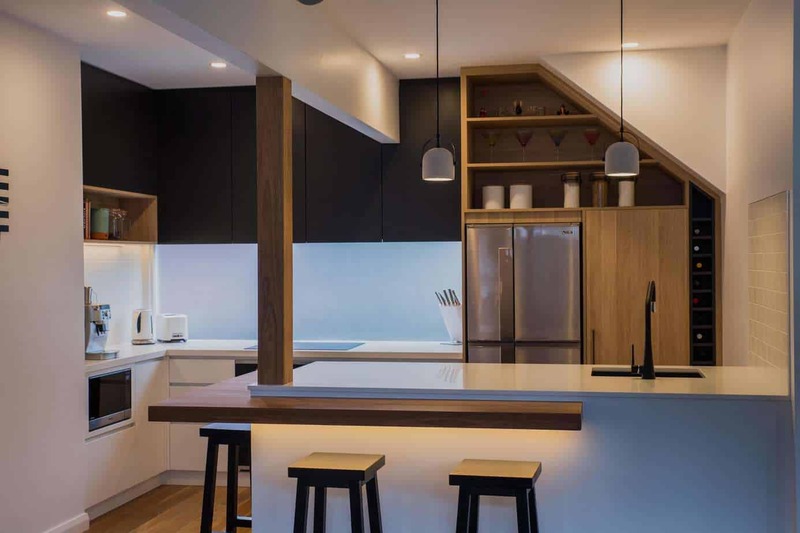 Rather than the timber post, you see we used some engineering ingenuity to move the post to a location within the kitchen space to create a beautiful structural feature that is perfectly situated to be unobtrusive. 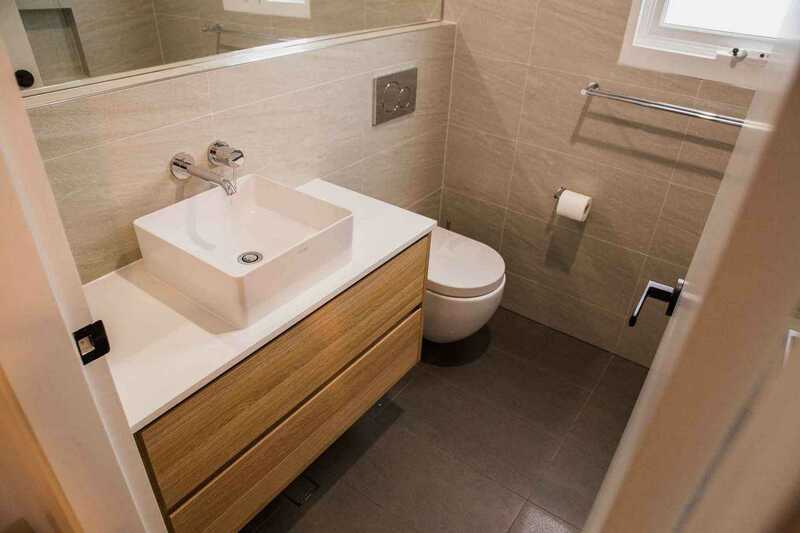 Another major challenge in this project was fitting everything into the bathroom space. We tailor-made a design to suit all the specific bathroom fixtures and fittings provided by the client prior to the construction phase. This ensured the greatest use of space and a design that not only works functionally but also aesthetically. These plans were developed by our project manager Adam in communication with our clients. A key feature of the success of this project was the use of new timber windows to complement the design of the new kitchen & bathroom. It is important not to limit your ideas to the existing window layout within your home. By replacing the existing windows with new windows we were able to create the perfect kitchen and bathroom configuration. 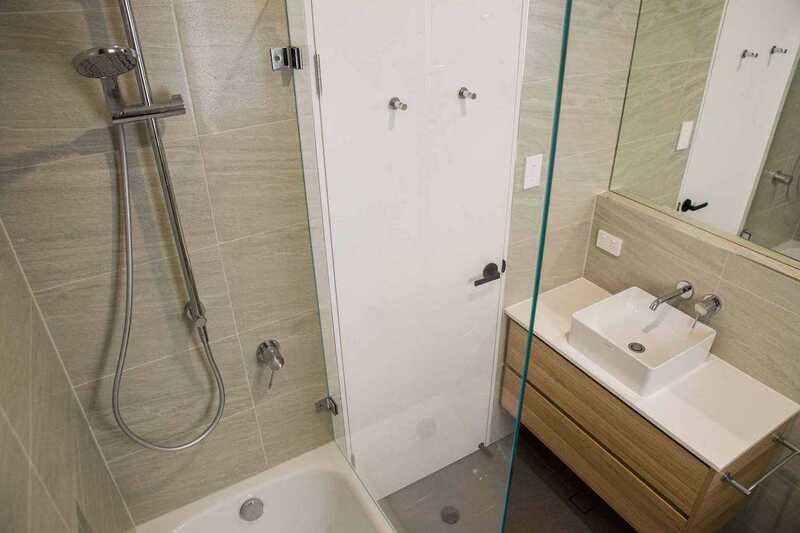 Aside from the bathroom and kitchen areas my favourite feature of the home is the new hardwood select grade blackbutt timber floor supplied and installed by Barefoot Timber Flooring. They did a fantastic job. 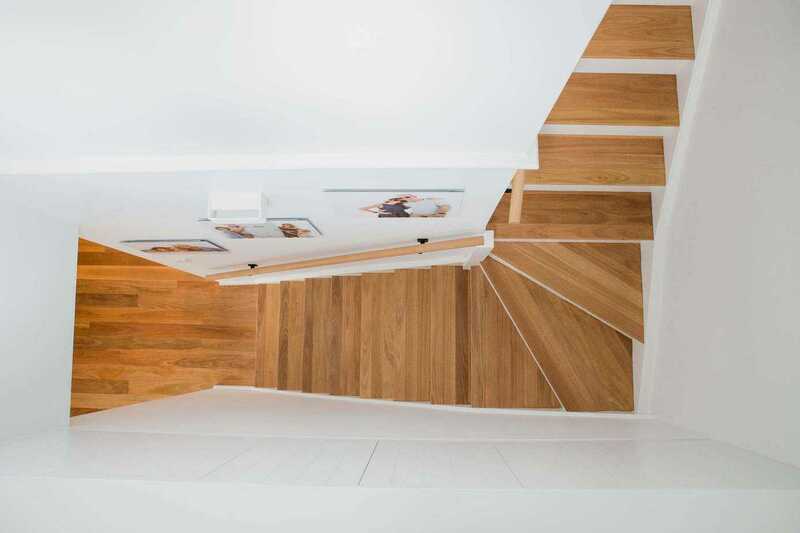 The floor forms an integral part of any home renovation and it is critical to get the right people for the job. We just loved working with these wonderful clients to create their dream home…and we think they enjoyed the process as much as we did! This project was the perfect example of how small changes to an existing home, can feel like you have got yourself a brand new home. Thanks Ross and Deb for having us!